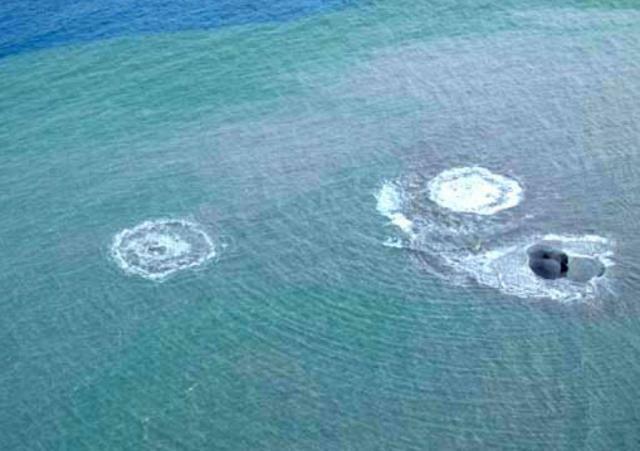 During an overflight of Ioto (Iwo-jima) on 12 September the Japan Maritime Self Defense Force observed seawater jetting 5-10 m above the sea surface on the S coast, suggestive of a submarine eruption. This report first briefly notes an article discussing deformation at Ioto (also called Iwo-jima), an island located within a submerged caldera ~1,200 km S of Tokyo. Ozawa and others (2007) discuss both complex deformation measured during 2006-2007 and the extremely high rate of uplift during the last few hundred years. The rest of this report is devoted to observations by the Japan Meteorological Association (JMA) and other agencies at Ioto during October 2010 to May 2012, including more deformation, small emissions of hot mud and steam, and discolored seawater that suggested a NE flank submarine eruption. 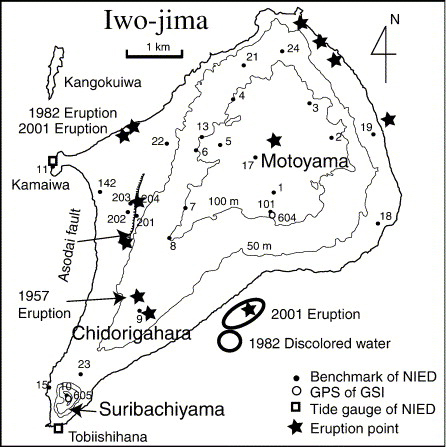 Our previous report on Ioto (Iwo-jima), discussed a submarine eruption off the SE coast that occurred in September 2001, and a small phreatic eruption at Idogahama, a beach on the NW coast of the island, in October 2001 (BGVN 26:09). Ioto is mildly seismically active with many fumaroles and occasional phreatic explosions, but the volcano has not experienced a magmatic eruption in 400 years (Newhall and Dzurisin, 1988; Lowenstern and others, 2006; Yokoyama and Nazzaro, 2002; and Ukawa and others, 2006). 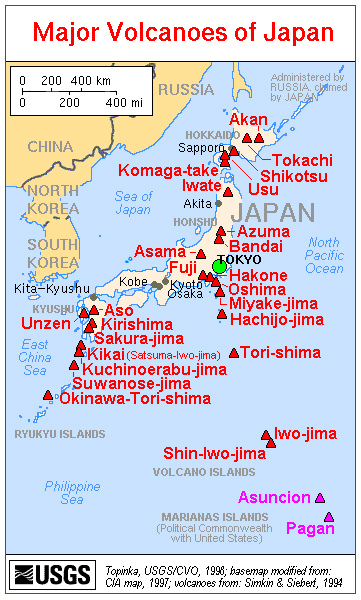 The locations of the major volcanoes of Japan, including the island of Ioto, are shown in figure 5. Figure 6 is a map of Ioto, summarizing its topography and past eruption sites. Figure 5. A map of the major volcanoes of Japan. Ioto (Iwo-jima) is shown in the lower right. Ioto is about 1,200 km SSE of Tokyo, in the Volcano Islands of the W Pacific Ocean. Courtesy of the U.S. Geological Survey. Figure 6. Map of Ioto showing topography, major features (including the Asodai fault), and past eruption sites. From Ukawa and others (2006). Deformation. Ozawa and others (2007) noted that the overall pattern of deformation seen in the last several hundred years averaged to ~0.25 m of uplift per year, but often exceeded uplift rates of 1 m per year. They plotted uplift and subsidence during January 2006-late 2007 from satellite radar interferometry. Concluding that the deformation pattern is very complicated both spatially and temporally, the authors noted that "In August of 2006, subsidence which had continued from 2003 rapidly changed to uplift, and an increase of seismicity was also observed simultaneously." They divided the uplift during August 2006-late 2007 into 3 stages. The authors used gravity and magnetic data to constrain the shape of the shallow intruding magma under the island's main edifice (Motoyama, also spelled Moto-yama) centered in the bulbous NE portion of the island (figure 6). They described the intruding magma body as having a funnel shape, narrowing towards the bottom and centered about the main topographic high. The authors' modeling suggested that the block of material trapped within the funnel was variously displaced during each of the deformation stages, shifting the block depending on where the magma pooled. JMA reports. The following material summarizes activity from October 2010 to May 2012, based on monthly volcanic activity reports from JMA. JMA reports on Ioto between November 2001 and September 2010 are not available in English; translations into English resumed in October 2010. In October 2010, Japan's National Research Institute for Earth Science and Disaster Prevention (NIED) reported that seismicity remained at a low level. GPS observations by the Geospatial Information Authority of Japan (GSI) indicated that an episode of uplift that had ceased around October 2009 resumed in May 2010. N-S baseline displacement (extension) accelerated during late September-early October 2010, accompanied by an eastward deformation in the central part of the island. The uplift slowed after mid-November 2010. This upheaval followed one that occurred during August 2006-October 2009. During 29-30 January 2011, aerial observations were conducted in cooperation with the Japan Maritime Self-Defense Force (JMSDF). No change in the distribution of thermal anomalies or emissions was detected since the last observation in July 2010. According to NIED and GSI, both shallow seismicity and the rate of uplift at Ioto increased in February 2011 and continued through at least January 2012. GPS measurements showed a rapid southward displacement at the S part of island. Moreover, between 26 August and 2 September 2011, a local westward displacement was observed SW and SE of Motoyama. A field survey during 16-18 November 2011 revealed that the water level in Asodai crater (along the fault of the same name, figure 6) had risen compared with the last observation during 29-30 January 2011. The temperature of the muddy water at the bottom of the pit was estimated to be ~100°C, the same as that observed in January 2011. Associated discharges reached a maximum height of 20 m above the crater. No change in the distribution of thermal anomalies or emissions was detected since the last observation in January 2011. On 10 February 2012, JMSDF reported a mud ejection at an old crater (another depression along the Asodai fault, a spot sometimes called "Million Dollar Hole"). According to field surveys on 14 and 15 February, three major ejection sites were aligned in the N-S direction, the deepest being about 13 m. Mud was ejected to distances of up to 100 m NE of the main vent. No seismicity was observed to be associated with this event, but JMA believed a very small phreatic explosion probably occurred during early February. The maximum temperature of the mud was 96.6°C. Another mud ejection occurred on 7 March in the same area, and mud was ejected up to 60 m WNW. Ash emissions also rose from Asodai, but not from Idogahama. During another field survey from 7 to 9 March 2012, further mud ejections were noted from the same area as the previous events on the island's W side. In addition, a very small phreatic eruption was noted, with tremor (90-minute duration) and intermittent ejections of steam plumes, mud, and small rocks. Emissions rose 20 m above the crater, and small amounts of ash rose more than 10 m and scattered within 20 m in every direction. During that time, the water level in Asodai crater was higher than that observed during the 16-18 November observation. During 5-6 April 2012, volcanic tremor and intermittent earthquakes were recorded, and two apparently very small phreatic eruptions were reported. This was accompanied by intermittent noises and emissions at the old crater to the W of the island. According to GSI, ground deformation and seismic activity were greater than usual during 27-28 April, but both subsided after 4 May. During 29-30 April, the ocean NE of the island was discolored, suggesting an offshore underwater eruption. An aerial observation conducted by the Japan Coast Guard (JCG) on 16 May revealed that discoloration persisted, but in smaller areas. On the N part of the island, steam plumes rose to heights of up to 10 m on 30 April. During May 2012, ground deformation was almost static. Seismic activity diminished, and no volcanic tremors were observed. Based on camera monitoring, emissions from Asodai crater were low, and no emissions were noted in Idogahama. References. Lowenstern, J.B., Smith, R.B., and Hill, D.P., 2006, Monitoring super-volcanoes: geophysical and geochemical signals at Yellowstone and other large caldera systems, Phil. Trans. R. Soc. A 364, p. 2055-2072. Yokoyama, I., and Nazzaro, A., 2002, Anomalous crustal movements with low seismic efficiency-Campi Flegrei, Italy and some examples in Japan, Annals of Geophysics, v. 45, no. 6, p. 709-722. Newhall, C.G., and Dzurisin, D., 1988, Historical unrest at large calderas of the world, U.S. Geological Survey Bulletin 1855: 1108 p, 2 vol, pgs. 509-520. Ukawa, M., Fujita, E., Ueda, H., Kumagai, T., Nakajima, H., and Morita, H., 2006, Long-term geodetic measurements of large scale deformation at Iwo-jima caldera, Japan, J. of Volcanology and Geothermal Research, v. 150, p. 98-118. Ozawa, T., Ueda, H., Ukawa, M., and Miyazaki, S., 2007, Temporal change in crustal deformation related to volcanic activity of Iwo-jima observed by PALSAR/InSAR, Proceedings of the First Joint PI Symposium of ALOS, Data Nodes for ALOS Science Program (DIS 10). Information Contacts: Japan Meteorological Agency (JMA), Otemachi, 1-3-4, Chiyoda-ku Tokyo 100-8122, Japan (URL: http://www.jma.go.jp/); Japan’s National Research Institute for Earth Science and Disaster Prevention (NIED), 3-1, Tennodai, Tsukuba, Ibaraki, 305-0006, Japan (URL: http://www.bosai.go.jp/e/); Geospatial Information Authority of Japan (GSI) (URL: http://www.gsi.go.jp/ENGLISH/); Japan Maritime Self-Defense Force (JMSDF) (URL: http://www.mod.go.jp/msdf/formal/english/index.html); Japan Coast Guard (JCG) (URL: http://www.kaiho.mlit.go.jp/e/index_e.htm). According to a JMA report on 2 May, an eruption at Ioto (Iwo-jima) caused water discoloration to the NE. A new fumarole was also confirmed. 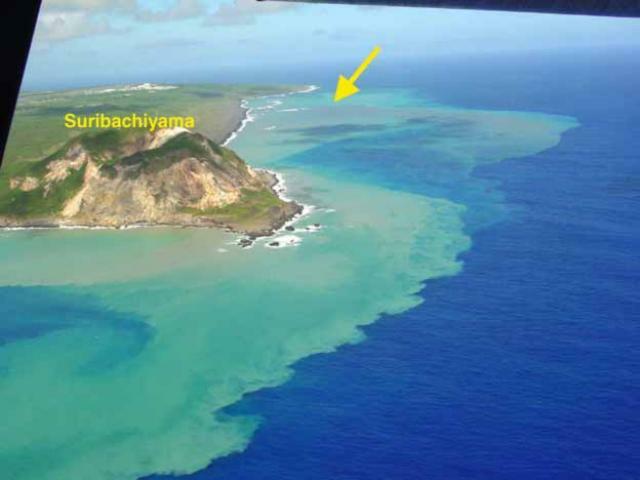 Based on a pilot observation, the Tokyo VAAC reported that an ash plume from Ioto (Iwo-jima) drifted more than 35 km N.
On the morning of 19 October a small phreatic eruption was observed at Idogahama, a beach on the NW coast of Iwo-jima. The Japan Maritime Self Defense Force observed a grayish white-colored plume rising to 200-300 m above the beach surface for 2-3 minutes starting at about 0725. A similar plume was observed for 10 minutes starting at 0806. Observations during 1602-1715 revealed the crater that formed during the eruption was 10 m long and 2-15 m deep. Water inside the crater was dark colored, contained debris, and gushed approximately every 10 minutes. In addition, a steam plume rose up to 600 m above the surface. No volcanic activity was observed at Iwo-jima after 22 September, but discolored seawater was occasionally visible along the SE coast until at least 10 October. The area of discolored water was smaller than when the submarine eruption began on 21 September. During 20 to about 28 September many earthquakes and tremor were detected. Floating pumice collected along Iwo-jima's coast after the eruption is being analyzed to determine if the eruption was magmatic or hydrothermal. At 1015 on 21 September a submarine eruption began off of the SE coast of Iwo-jima, an island inhabited by U.S. and Japanese military personnel approximately 1,300 km S of Tokyo. The eruption was preceded by isolated and continuous tremor beginning on the evening of 20 September. Visible evidence of the eruption consisted of seawater gushing several meters above sea level near the island's coast and an area of discolored seawater extending 300-400 m in length. During 1000-1100 approximately 30 earthquakes occurred in the active area; the typical rate is one or two earthquakes per hour. The climax of the eruption occurred during 1200-1500. At about 1300 water gushed several ten's of meters above sea level and steam rose to 100-300 m above the sea. JMA personnel observed seawater rising intermittently during 1515-1715 at two points 50 m apart and 150-200 m from the island's SE coast. The temperatures at these points were 33-34 ºC and 50 ºC, while the surrounding water was at 27 ºC. By 1500 ten earthquakes were recorded per hour. During 1600-1700 three eruption sites were visible; at one a pyroclastic cone was slightly above the sea surface. JMA reported that by the next day volcanic and seismic activity returned to usual levels, with zero to four earthquakes occurring per hour and no tremor events. Five small phreatic explosions without detonations or recorded seismic events were reported by the Japanese National Research Center for Disaster Prevention. They occurred 9-10 March on the NW shore of the island, producing a new crater N of Asodai Crater (which erupted in 1967, 1969, 1976 and 1978) and "Million Dollar Hole." The three craters lie on the Asodai fault. The ejecta were no larger than 25 cm in diameter and were scattered within 300 m of the new crater. No juvenile material was found, only fragmented older rock. The National Research Center for Disaster Prevention reported that two weak steam explosions from Asodai Crater 28-29 November 1982 were associated with an earthquake swarm 25-30 November. Among the 1,492 recorded seismic events were 13 felt shocks. Before the swarm, the maximum number of recorded seismic events for a 5-day period had been 104. The earthquakes cracked roads in some places. 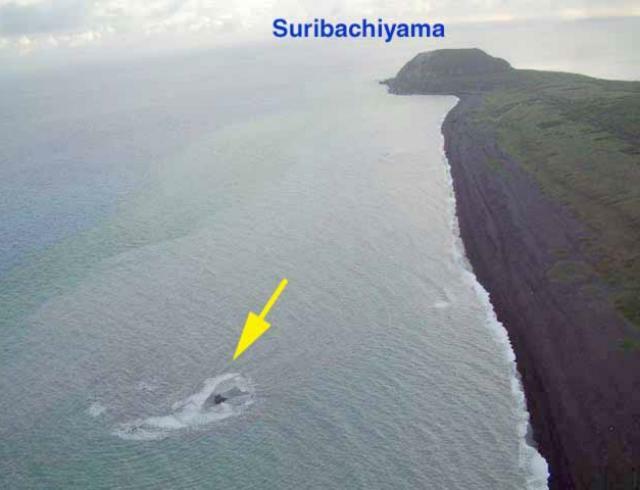 A submarine eruption at Iwo-jima, off of the island's SE coast, on 21 September was the first reported volcanic activity since November 1982 when an earthquake swarm and weak steam explosions occurred at Asodai Crater (SEAN 08:04). Approximately 1 month after the submarine eruption on the SE side of the island, a small phreatic eruption occurred at Idogahama, a beach on the NW coast of the island. At 1015 on 21 September a submarine eruption began off of the SE coast of Iwo-jima, an island inhabited by U.S. and Japanese military personnel approximately 1,250 km S of Tokyo. The Japan Maritime Self Defense Force stationed on Iwo-jima observed the eruption, which was preceded by isolated and continuous tremor beginning on 20 September at 2000. Visible evidence of the eruption consisted of seawater gushing several meters above sea level near the island's SE coast. In addition, the eruption was accompanied by an area of discolored seawater extending 300-400 m in length. During 1000-1100 approximately 30 earthquakes occurred in the active area; the typical rate is one or two earthquakes per hour. The climax of the eruption occurred during 1300-1500. At about 1300 water gushed ~40 m above sea level and accompanying steam rose to 100-300 m. During 1515-1715, Japan Meteorological Agency (JMA) personnel observed seawater rising intermittently in two small dark-gray colored areas 50 m apart and 150-200 m from the island's SE coast (Okinahama beach). The two areas were surrounded by zones of bubbling, white-colored water. The water outside the bubbling zone was emerald green in color. A plume of water rose every few to ten minutes in the western-most area. Measurements with an infrared thermometer revealed that the temperatures in these two areas were 33-34°C and 50°C, while the surrounding water was at 27°C. An approximately 8-km-long and 500-m-wide area of discolored water stretched away from the two areas. By 1500 the number of earthquakes decreased from 30 per hour to about ten. During 1600-1700 three eruption sites were visible; at one a pyroclastic cone was slightly above the sea surface (figures 1 and 2). Figure 1. Photograph showing three activity sites off the SE coast of Iwo-jima on 21 September 2001 during 1600-1700. Water depth in this area is less than 10 m. A pyroclastic cone that rose above the sea surface is visible at the site furthest to the right; at sea level the diameter of the cone was ~10 m. The coast (Okinahama beach) is approximately 150-200 m to the W (right on the photo). Photo courtesy of Mr. Odai, JMA. Figure 2. Submarine eruption off the SE coast of Iwo-jima on 21 September 2001 during 1600-1700. The arrow indicates the location of the bubbling water shown in figure 1. The photo was taken facing towards the SW coast of the island. Okinahama beach is visible to the right. Photo courtesy of Mr. Odai, JMA. JMA reported that the day after the eruption, 22 September, volcanic and seismic activity returned to usual levels, with no water plumes observed and 0-4 earthquakes per hour. In addition, the isolated and continuous tremor events that were recorded during the night of 20 September to the morning of 22 September temporarily ceased. After 21 September areas of discolored water were still visible (figure 3). Until about 28 September many earthquakes and tremor were detected. 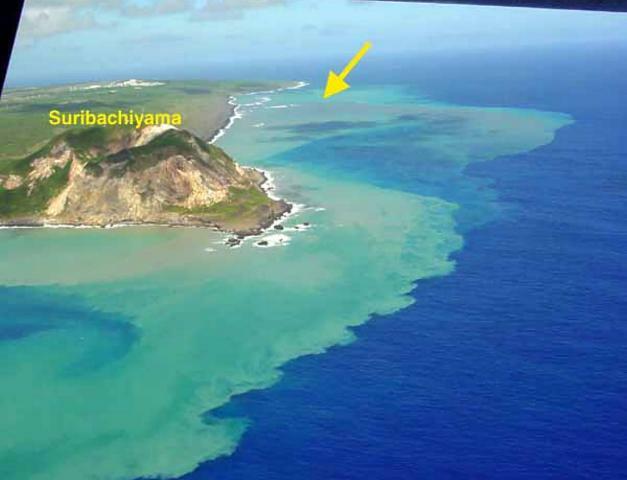 Results are pending from the analysis of floating pumice that was collected along Iwo-jima's coast after the eruption. Until at least 10 October areas of discolored water were occasionally seen; these were smaller than when the submarine eruption began on 21 September. Figure 3. View of the SE side of Iwo-jima on 22 September during 1300-1400, about 27 hours after the start of a submarine eruption. The arrow indicates the location of bubbling water seen the day before. An area of green and tan discolored water (light water near the coast on the photo) is visible extending an unstated distance along and beyond the SE coast. Photo courtesy of Mr. Nakahori, JMA. After 21 September there was no volcanic activity at Iwo-jima until 19 October. On the morning of 19 October a small phreatic eruption was observed at Idogahama, a beach on the NW coast of the island. The last reported volcanic activity at Idogahama occurred in March 1982 and consisted of a small phreatic eruptions (SEAN 07:09). The Japan Maritime Self Defense Force observed a grayish-white colored plume rising to 200-300 m above the beach surface for 2-3 minutes starting at about 0725. Another similarly sized plume was observed for 10 minutes starting at 0806. JMA, with support from the Japan Maritime Self Defense Force and the Japan Air Self Defense Force, observed the eruption from a helicopter soon after it began. JMA personnel observed the eruption during 1602-1715 and measured the temperature of the eruption site with an infrared camera. They estimated that the main crater formed during the eruption was about 10 m long and 2-3 m deep. Inside the crater, every 10 minutes intermittent gushing of black water and entrained debris was observed (figure 4). An accompanying white steam plume reached a maximum height of 600 m above the beach during the observations. The temperature inside the crater was 56°C. Figure 4. 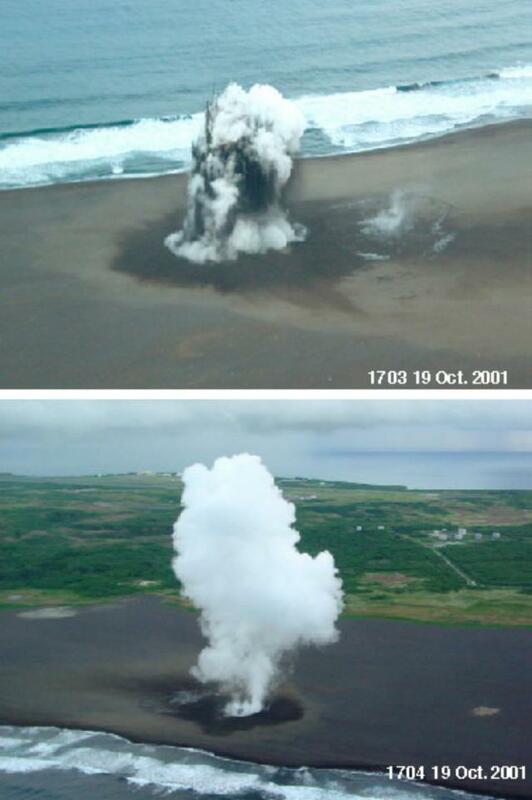 Small phreatic eruption at Idogahama, a beach on the NW coast of Iwo-jima, at 1703 (top) and 1704 (bottom) on 19 October 2001. The crater is about 10 m long and 2-3 m deep. The steam cloud rose to a maximum height of 600 m above the beach. Photo courtesy of Mr. Odai and Mr. Nakahori, JMA. Information Contacts: Setsuya Nakada, Volcano Research Center, Earthquake Research Institute, University of Tokyo, Yayoi 1-1-1, Bunkyo-ku, Tokyo 113-0032, Japan (URL: http://www.eri.u-tokyo.ac.jp/VRC/index_E.html); Mr. Odai, Mr. Nakahori, and Tomoyuki Kanno, Volcanological Division, Seismological and Volcanological Department, Japan Meteorological Agency (JMA), 1-3-4 Ote-machi, Chiyoda-ku, Tokyo 100 Japan (URL: http://www.jma.go.jp/). Ioto (changed from Iwo-jima in 2007) in the central Volcano Islands portion of the Izu-Marianas arc lies within a 9-km-wide submarine caldera. Ioto, Iwo-jima, and Iojima are among many transliterations of the name. The volcano is also known as Ogasawara-Iojima to distinguish it from several other "Sulfur Island" volcanoes in Japan. The triangular, low-elevation, 8-km-long island narrows toward its SW tip and has produced trachyandesitic and trachytic rocks that are more alkalic than those of other Izu-Marianas arc volcanoes. The island has undergone dramatic uplift for at least the past 700 years accompanying resurgent doming of the caldera. A shoreline landed upon by Captain Cook's surveying crew in 1779 is now 40 m above sea level. The Motoyama plateau on the NE half of the island consists of submarine tuffs overlain by coral deposits and forms the island's high point. Many fumaroles are oriented along a NE-SW zone cutting through Motoyama. Numerous historical phreatic eruptions, many from vents on the west and NW sides of the island, have accompanied the remarkable uplift. Notsu K, Sugiyama K, Hosoe M, Uemura A, Shimoike Y, Tsunomori F, Sumino H, Yamamoto J, Mori T, Hernandez P A, 2005. Diffuse CO2 efflux from Iwojima volcano, Izu-Ogasawara arc, Japan. J. Volcanol. Geotherm. Res., 139: 147-161. Ukawa M, Fujita E, Ueda H, Kumagai T, Nakajima H, Morita H, 2006. Long-term geodetic measurements of large scale deformation at Iwo-jima caldera, Japan. J. Volcanol. Geotherm. Res., 150: 98-118. Reference List: Ohkura et al. 1998. Ohkura, H., 1998. Application of SAR data to monitoring earth surface changes and displacement. Advances in Space Research, 21(3), 485-492. Remarks: Concentric subsidence around Motoyama at the center of the Iwo-jima caldera is surrounded by a region of uplift. Reference List: Ukawa et al. 2005. Ukawa, M., E. Fujita, H. Ueda, T. Kumagai, H. Nakajima, and H. Morita, 2005. Long-term geodetic measurements of large scale deformation at Iwo-jima caldera, Japan. J. Volcanol. Geotherm. Res., 150: 98-118. There is no Emissions History data available for Ioto. Discolored water from a submarine eruption in September 2001 surrounds Ioto, also known as Iwo-jima. The triangular, 8-km-long island, whose name means "Sulfur Island," lies within a 9-km-wide submarine caldera and narrows toward its SW tip, where the Suribachiyama cone is located. The yellow arrow marks the site of the 2001 submarine vent. Ioto (Iwo-jima) has undergone dramatic uplift for at least the past 700 years accompanying resurgent doming of the caldera. Numerous historical phreatic eruptions have accompanied the remarkable uplift. There are no samples for Ioto in the Smithsonian's NMNH Department of Mineral Sciences Rock and Ore collection. Large Eruptions of Ioto Information about large Quaternary eruptions (VEI >= 4) is cataloged in the Large Magnitude Explosive Volcanic Eruptions (LaMEVE) database of the Volcano Global Risk Identification and Analysis Project (VOGRIPA).